Five nights a week, an Immigration and Customs Enforcement (ICE) van drops off a group of immigrants at the Tucson Greyhound bus station. These are people who have been recently released from an ICE-contracted private detention facility in Eloy, Arizona. In June, I went to the bus station with the Restoration Project, a Tucson-based group that puts people in the station every night to greet the migrants who are often disoriented after their long stays in the prison. The project offers them a phone if they need to make a call, assistance in buying a bus ticket if they don’t speak English, or a bed to stay the night, if it was too late to get a bus. Sara, a woman from Michoacan, Mexico, came into the station like many of the others, with a clear plastic bag holding the scant personal belongings (what she had at the time of her detainment), and a yellow envelope containing her release papers. We approached her awkwardly, and she did need a phone to call her mom in San Jose, California. Sara told us that she hadn’t seen her children, her four-year-old son and six-year-old daughter, in more than a month. She had already bought a ticket for the 10:50 pm bus, and she wanted to tell them that she would be home the next day. Her voice was emotional. About a month before, she was driving to work on a Saturday like she always did, and the police pulled her over as part of a routine traffic stop. The next thing she knew she was in blazing-hot Eloy, Arizona at the immigration detention facility, privately run by the Corrections Corporation of America. CCA makes approximately $122 per bed on a daily basis. Her stay earned them $3,660. Sara didn’t fare quite as well. She lost her job at the restaurant where she was working and her kids were suddenly motherless—all because of a traffic ticket. Knowing that her deportation case was probably still pending, I thought of Sara on August 18, when the Obama administration announced that it was going to review 300,000 deportation cases, allowing those deemed “low-priority” a temporary reprieve, as long as they have had no criminal record. Photo Credit: Flickr- presenteorgLimiting this to the normal partisan debate, however, marginalizes the real issue for many immigration rights groups. While the deportation reprieve could be potential relief to the people who qualify, like maybe Sara, it is also a far cry from the comprehensive immigration reform promised by Obama during his presidential campaign, which he said would be completed within a year of taking office. In this sense, it doesn’t respond to the vociferous demands across the country this month—in protests and public hearings from California to Illinois, New York to Massachusetts—to do away with the Secure Communities program, known as S-Comm. This program, along with other DHS initiatives, are giving local police rapidly increasing power to enforce immigration law. It is not immigration reform, but these types of enforcement policies that are defining the Obama administration. By turning local law enforcement into de facto Border Patrol agents, the federal government, following the lead of Bush administration, is constructing a deportation dragnet that rivals nothing else ever seen in the United States. It exiles an average 400,000 people per year, 20 times more than the 20,000 deported in 1980. And many argue that it aims to create a permanent, docile subclass of undocumented workers, who will remain quiet, instead of risk deportation. Even more startling is that this dragnet is becoming more and more an essential part of the $18 billion per year DHS immigration-enforcement machine. This bureaucratic enforcement powerhouse, the largest law-enforcement body in the United States, directly employs more than 50,000 people (between Immigration and Customs Enforcement (ICE), and Customs and Border Protection). Through its direct employment, and indirect contracts (like those with CCA) it has become more than an institution, it is also an industry that will be more and more difficult to reverse. DHS secretary Janet Napolitano assured critics on August 30, that even with the possible temporary reprieve of some of these cases, that deportations would remain “very robust,” because “we don't fool around about this, ” as if she were quelling the fears of investors on Wall Street. “Our border enforcement is second to none,” she concluded. So, according to Napolitano’s words, the reprieve will not slow down the dragnet at all. But we already knew this. 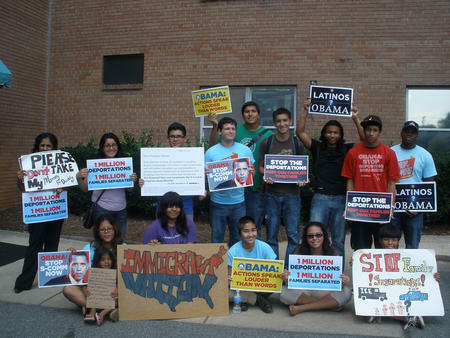 On August 5, the Obama administration announced that S-Comm, the most essential piece, and public face, of the deportation machine, would be made mandatory throughout the country by 2013. State governments in Illinois, New York, and Massachusetts could not opt out of the federal program, as they had requested. It was this 2008-implemented DHS program that, after Sara’s traffic stop in San Jose, sent her against her will, and without her children, to the immigration detention center in Eloy. Through S-Comm, finger prints are automatically searched against immigration data bases. If, through this process, ICE determines that a person might be deportable, it requests that the person be detained and transferred to immigration authorities. Salt Lake City’s Police Chief Chris Burbank goes as far as to say, “since the inception of Secure Communities, and state mandated immigration checks, I am aware of agencies that have adopted a practice of booking any person of color on traffic violations if they are unable to demonstrate citizenship.” This has also caused, some law enforcement officials warn, “diminished trust” between the immigrant communities and the police, which has “compromised” public safety. Burbank speaks to a strong, rapidly increasing dynamic of replicating enforcement tactics on the physical U.S.-Mexico border, into communities throughout the country’s interior. The Border Patrolization of the country is rapid-fire. Communities in the interior are becoming more like communities on the edges of the country and, thus, more hyper-sensitive to immigration issues. The artificial borders placed between immigrant, immigration enforcement agent, and citizen become even more difficult to overcome. Perhaps the August 18 announcement was to alleviate demands across the country by different organizations and even governments, that S-Comm be suspended. One strong criticism has been that the majority of people deported through S-Comm have not been criminals. Now DHS says that “criminal aliens,” a term that has no official definition, are their priority. In response to this, The New York State Working Group Against Deportation, composed of a coalition of immigrant rights groups, said, “We want to be clear that this isn’t what many of us have asked for. In fact, it’s the exact opposite. Our coalition has vociferously called for the protection of the rights of all immigrants, not just those who can be deemed 'innocent' or 'low priority.' "
“Luckily my mom lives in San Jose,” Sara said in Spanish when she got off the phone at the Greyhound station, “or I wouldn’t have known what to do with the kids.” She was trying to smile. “But now I can go home.” Maybe she realized, in the logic of U.S. domestic immigration policy, she was one of the lucky ones. She wasn’t deported like a million other people since Obama took office. The next day she would be able to see her children in San Jose. Read other posts from the Border Wars blog.